Some regular producers from the Middle East have revealed their March PP offers to China with increases of up to $70/ton in the import market, blaming their tight supplies. Nevertheless, a stable to soft trend remains in place in the local market, causing the local market to trade at a discount. Indeed, this discount has expanded to reach a year high as of this week, as per the pricing service of ChemOrbis. 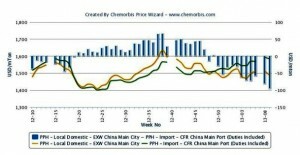 A source from a Middle Eastern producer reported, “We lifted our March prices for Saudi Arabian homo-PP injection and raffia by $40/ton owing to tight supply and firming global price trends.”A source at a Saudi Arabian producer also stated that they raised their March prices for homo-PP injection by $70/ton on CFR China basis. “Our March allocations to China are less than half of our normal levels and we are not able to offer any PP raffia or BOPP this month,” the source commented. All the same, traders are not able to follow these hike attempts in the import market as they are seeing very limited buying interest. Plus, much more competitive prices with respect to imports are obtainable in the local market, where a domestic producer along with several distributors consented to further discounts this week in order to entice some sales. 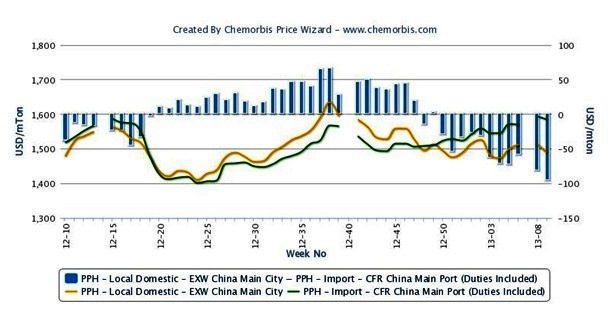 Indeed, the local market has been trading at a discount when compared to imports since late last year, as can be seen from the graph prepared by ChemOrbis Price Wizard. However, this week the divergent path seen in the import and local markets in China has caused the discount to expand and reach an average of almost $100/ton, the highest level seen over the past year.